The XBR-X850A reviewed here is the third model in Sony's premium Ultra HD (4K) line of televisions. 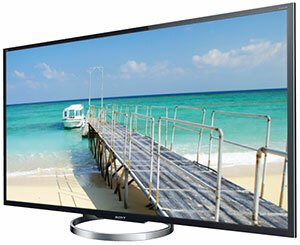 In late 2012, Sony released the ginormous 84-inch XBR-84X900. Earlier this year, Sony followed with the 55 and 65-inch versions in the X900A series, which integrated a robust speaker system that flanked the screen. More recently, with the X850A series (offered in both 55 and 65-inch sizes) the Sony designers swapped the side-positioned speaker system with a more conventional - and less full-bodied - down firing arrangement below the screen. This decision pares the dimensions of the X850A models, as well as their price. The display technologies (video processing, backlighting and local dimming) of the X900A and the X850A are identical, which is a very good thing. In September, when I reviewed the 65-inch XBR-65X900A, I was rhapsodic about its picture quality. Even though I think the extra resolution of these 4K Ultra HD TVs, (which has four times the pixels of an HDTV [3840 x 2160 vs. 1920 x 1080]), becomes more apparent with larger and larger screens, I am still enamored with the delicious picture quality of this 55-inch XBR-55X850A. Would I prefer the 65-inch version? In the blink of a 4K pixel. For this review of the XBR-55X850A, I was sent the Sony FMP-X1, a 4K Ultra HD Media Player, which completes the Sony 4K ecosystem. With the FMP-X1, you can store and playback native 4K mastered content like the expansive and exquisite Laurence of Arabia. I'll talk more about this Ultra HD dynamic duo of TV and media player in the Performance section. From previous reviews of Sony TVs, I was already enamored with the picture quality of Sony's TRILUMINOS display, which also is used in the XBR-55X850A. This 4K TV does an excellent job of upscaling HD resolution content. When it is paired with the FMP-X1, a 4K Ultra HD Media Player, the display of native 4K material is ultra-delectable. The fidelity on the 30W 2.1 speaker system is excellent. Certain musical passages at higher volumes will tend to rattle and don't expect a full surround sound. The Sony Entertainment Network provides a bevy of Internet apps and the XBR-55X850A supplies an integrated Wi-Fi adapter as well as other connectivity options. You can deduct a half a point or two if you must have motion or voice control because they are not included and the TV is better off without them. The initial setup is straightforward. And don't be leery of the Ultra HD aspect, it doesn't add any layer of difficulty. Though, if you can afford this 4K TV, consider hiring a professional to set up and calibrate it. I don't know how long that will be the case, but at $3000 this Ultra HD TV is dropping down to the cost of a high-end HDTV. It's not quite there yet, but at three grand for a fully featured, high performance Ultra HD TV, the decision about jumping to 4K just became more compelling, especially if you pair it with the Sony FMP-X1 Ultra HD player.